“You think that a second signing day is a little anticlimactic, but it’s not. It ended up being a really good start to the day. We were able to land the exact prospect we wanted at the exact position that we needed. So for us it’s been an extremely exciting and satisfying morning with the addition of Jamal Hill, DJ James and Kristian Williams,” coach Mario Cristobal said. 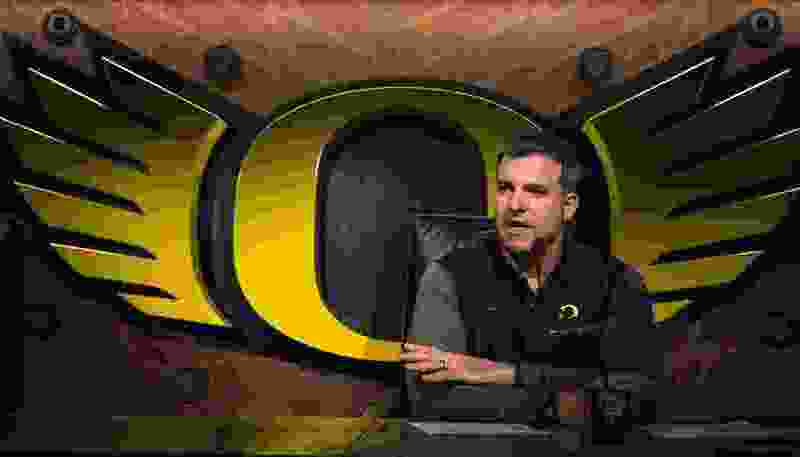 The Ducks went 9-4 last season in Cristobal’s first year. The team got a boost heading into the upcoming season when quarterback Justin Herbert decided to stay in Eugene for his senior year. One of the prospects that Oregon signed in December was Herbert’s little brother, tight end Patrick Herbert. Other things of note across the Pac-12 for Wednesday’s signing day. “In our mind it was pretty clear cut,” Washington coach Chris Petersen said of Turner as a safety. Last season, Laviska Shenault Jr. caught 86 passes for 1,011 yards and six TDs for the Buffaloes despite missing time with a toe injury. He was a first-team All-Pac-12 selection and was named the team’s MVP. Like his big brother, La’Vontae Shenault is 6-foot-2 and played at DeSoto High School in Texas. La’Vontae amassed 135 catches for 1,717 yards and 12 TDs over the last two seasons for DeSoto. Maurice Gaines, cb, 6-1, 185, St. Thomas More, Sacramento, Calif.
Jalen Johnson, wr, 6-2, 170, Eleanor Roosevelt, Corona, Calif.
Jordan Morgan, ot, 6-5, 270, Marana, Marana, Ariz.
Kyle Ostendorp, p, 6-2, 195, Desert Vista, Phoenix, Ariz.
Chris Roland, ath, 6-0, 180, William Knight, Palmdale, Calif.
Jaxen Turner, s, 6-2, 175, Rancho Verde, Moreno Valley, Calif.
Kwabena Watson, olb, 6-3, 205, Edison, Fresno, Calif.
Jamari Williams, og, 6-4, 275, Cardinal Gibbons, Fort Lauderdale, Fla.
Alijah Bates, ot, 6-8, 235, Doherty, Colorado Springs, Colo.
Jordan Clark, cb, 5-11, 168, University Lab, Baton Rouge, La. Jayden Daniels, qb, 6-3, 175, Cajon, San Bernardino, Calif.
Roman DeWys, ot, 6-5, 280, Basha, Chandler, Ariz.
Willie Harts, cb, 6-0, 170, Pittsburg, Pittsburg, Calif.
Amiri Johnson, sde, 6-6, 235, Diamond Ranch, Pomona, Calif.
Andre Johnson, wr, 6-3, 185, Tolleson Union, Tolleson, Ariz.
Ethan Long, qb, 6-2, 212, West Linn, West Linn, Ore.
Kejuan Markham, s, 6-1, 180, Long Beach Poly, Long Beach, Calif.
Keon Markham, wr, 6-0, 175, Long Beach Poly, Long Beach, Calif.
Ricky Pearsall, wr, 6-1, 195, Corona Del Sol, Tempe, Ariz.
Connor Soelle, ath, 6-1, 195, Saguaro, Scottsdale, Ariz.
Dohnovan West, oc, 6-3, 290, Bishop Alemany, Mission Hills, Calif.
Stephon Wright, sde, 6-3, 260, Cathedral, Los Angeles, Calif.
Joey Yellen, qb, 6-2, 211, Mission Viejo, Mission Viejo, Calif.
Blake Antzoulatos, ilb, 6-2, 225, Chaminade, West Hills, Calif.
Spencer Brasch, qb, 6-4, 190, Higley, Gilbert, Ariz.
DeCarlos Brooks, ath, 5-9, 188, Chandler, Chandler, Ariz.
Ben Coleman, dt, 6-3, 300, Linfield Christian School, Temecula, Calif.
Braxten Croteau, wde, 6-5, 240, Liberty, Peoria, Ariz.
Brian Driscoll, ot, 6-4, 278, Torrey Pines, Encinitas, Calif.
Brett Johnson, dt, 6-4, 273, Desert Vista, Phoenix, Ariz.
Jaylen Martin, cb, 6-2, 170, Eleanor Roosevelt, Corona, Calif.
Elijah Mojarro, te, 6-4, 225, Orange Lutheran, Orange, Calif.
Orin Patu, olb, 6-4, 200, Rainier Beach, Seattle, Wash.
Makai Polk, ath, 6-3, 174, El Cerrito, El Cerrito, Calif.
Ryan Puskas, olb, 6-3, 210, Liberty, Peoria, Ariz.
Brayden Rohme, ot, 6-6, 270, Perry, Gilbert, Ariz.
Kyle Smith, ilb, 6-3, 215, Los Gatos, Los Gatos, Calif.
Joshia Davis, rb, 5-10, 180, Valor Christian, Littleton, Colo.
Marvin Ham, ilb, 6-1, 217, Belleville, Belleville, Mich.
Braedin Huffman-Dixon, wr, 6-3, 180, Mater Dei, Santa Ana, Calif.
Austin Johnson, og, 6-4, 260, Highlands Ranch, Littleton, Colo.
Tarik Luckett, wr, 6-3, 190, J Serra Catholic, San Juan Capistrano, Calif.
Jaren Mangham, ath, 6-1, 214, Cass Technical, Detroit, Mich.
Trustin Oliver, db, 6-2, 200, Legend, Parker, Colo.
Alec Pell, olb, 6-4, 230, Cherry Creek, Englewood, Colo.
Mark Perry, s, 6-1, 190, Rancho Cucamonga, Rancho Cucamonga, Calif.
Nikko Pohahau, ot, 6-5, 275, St. Francis, Mountain View, Calif.
Na’im Rodman, dt, 6-2, 290, St. John Bosco, Bellflower, Calif.
Jayden Simon, dt, 6-4, 280, Lincoln, Tacoma, Wash.
KJ Trujillo, cb, 6-1, 170, Orange Lutheran, Orange, Calif.
Jake Wiley, og, 6-5, 250, Eaglecrest, Aurora, Colo.
Austin Williams, dt, 6-4, 288, Tift County, Tifton, Ga.
Trikweze Bridges, s, 6-3, 175, Lanett, Lanett, Ala.
Josh Delgado, wr, 5-11, 181, IMG Academy, Bradenton, Fla.
Sean Dollars, apb, 5-10, 185, Mater Dei, Santa Ana, Calif.
Brandon Dorlus, sde, 6-2, 270, Deerfield Beach, Deerfield Beach, Fla.
Ge’mon Eaford, olb, 6-2, 230, Deerfield Beach, Deerfield Beach, Fla.
Mase Funa, ilb, 6-2, 245, Mater Dei, Santa Ana, Calif.
Patrick Herbert, te, 6-5, 225, Sheldon, Eugene, Ore.
Jamal Hill, s, 6-1, 195, Morrow, Morrow, Ga.
Camden Lewis, k, 6-0, 185, William Amos Hough, Cornelius, N.C.
Treven Ma’ae, wde, 6-4, 240, Bishop Gorman, Las Vegas, Nev.
Cale Millen, qb, 6-4, 190, Mount Si, Snoqualmie, Wash.
Mycah Pittman, wr, 5-11, 195, Calabasas, Calabasas, Calif.
Suaava Poti, dt, 6-3, 285, St. John Bosco, Bellflower, Calif.
Jonah Tauanu’u, ot, 6-5, 327, Narbonne, Harbor City, Calif.
Kayvon Thibodeaux, wde, 6-4, 239, Oaks Christian, Thousand Oaks, Calif.
Isaac Townsend, olb, 6-6, 241, Ralston Valley Senior, Arvada, Colo.
Keyon Ware-Hudson, dt, 6-3, 305, Mater Dei, Santa Ana, Calif.
JR Waters, wr, 6-3, 185, Oxnard, Oxnard, Calif.
Lance Wilhoite, wr, 6-2, 186, Franklin Road Academy, Nashville, Tenn.
Kristian Williams, dt, 6-3, 297, Southwind, Memphis, Tenn.
Jayvaun Wilson, ath, 6-2, 210, Valencia, Valencia, Calif.
Mykael Wright, cb, 5-11, 180, Antelope Valley, Lancaster, Calif.
Akili Arnold, ath, 6-1, 190, Mission Viejo, Mission Viejo, Calif.
Alex Austin, cb, 6-1, 174, Long Beach Poly, Long Beach, Calif.
Evan Bennett, dt, 6-3, 315, Mater Dei, Santa Ana, Calif.
Cade Brownholtz, wde, 6-2, 221, Jesuit, Carmichael, Calif.
Jackson Cloyd, olb, 6-3, 230, Orange Lutheran, Orange, Calif.
Michael Erhart, olb, 6-1, 212, Chaminade, West Hills, Calif.
Jacob Ferenczi, og, 6-6, 280, North Bend, North Bend, Ore.
Jojo Forest, cb, 5-11, 175, Mission Viejo, Orange, Calif.
Ryan Franke, olb, 6-4, 210, Oaks Christian, Westlake Village, Calif.
Anthony Gould, ath, 5-10, 180, West Salem, Salem, Ore.
Kelsen Hennessy, dt, 6-5, 250, Clackamas, Clackamas, Ore.
Kade Hustler, sde, 6-3, 245, Southridge, Beaverton, Ore.
Taron Madison, rb, 6-1, 205, Banning, Banning, Calif.
Luke Musgrave, te, 6-6, 234, Bend Senior, Bend, Ore.
Wynston Russell, cb, 5-11, 180, Homewood-Flossmoor, Flossmoor, Ill.
Cam Sanders, te, 6-4, 215, Crescent Valley, Corvallis, Ore.
Omar Speights, ilb, 6-1, 235, Crescent Valley, Corvallis, Ore.
Cory Stover, sde, 6-6, 215, Marshfield Senior, Coos Bay, Ore.
Dylan Black, ls, 6-1, 200, Reno, Nev.
James Rawls, de, 6-3, 265, Inglewood, Calif.
Tanner Miller, og, 6-4, 300, Valencia, Calif.
Dejon Benton, dt, 6-2, 260, Pittsburg, Pittsburg, Calif.
Kenan Christon, rb, 5-10, 185, Madison, San Diego, Calif.
Trey Davis, cb, 6-0, 185, Federal Way, Federal Way, Wash.
Kyle Ford, wr, 6-2, 212, Orange Lutheran, Orange, Calif.
Tilini Livai, og, 6-3, 300, Narbonne, Harbor City, Calif.
Drake London, wr, 6-4, 200, Moorpark, Moorpark, Calif.
Munir McClain, wr, 6-4, 210, J Serra Catholic, San Juan Capistrano, Calif.
Ethan Rae, te, 6-4, 240, Orange Lutheran, Orange, Calif.
Jason Rodriguez, ot, 6-6, 326, Oak Hills, Hesperia, Calif.
Jaylen Watson, db, 6-2, 190, Ventura College, Augusta, Ga.
Jayden Williams, s, 6-1, 190, Centennial, Corona, Calif.
Bradley Archer, te, 6-4, 240, Livermore, Livermore, Calif.
Colby Bowman, wr, 6-3, 190, St. John Bosco, Bellflower, Calif.
Aeneas DiCosmo, wde, 6-3, 220, Bergen Catholic, Oradell, N.J.
Marcus Graham, ath, 6-0, 175, Mountain Island Charter, Mount Holly, N.C.
Stephen Herron Jr., wde, 6-3, 238, Trinity, Louisville, Ky.
Jake Hornibrook, og, 6-4, 275, Malvern Prep, Malvern, Pa.
Austin Jones, rb, 5-10, 195, Bishop O’Dowd, Oakland, Calif.
Brock Jones, s, 6-0, 175, Buchanan, Clovis, Calif.
Kyu Kelly, cb, 6-1, 175, Bishop Gorman, Las Vegas, Nev.
Wakely Lush, te, 6-5, 240, San Clemente, San Clemente, Calif.
Zahran Manley, cb, 6-2, 176, Upland, Upland, Calif.
Barrett Miller, ot, 6-5, 270, Eaglecrest, Aurora, Colo.
Drake Nugent, oc, 6-2, 275, Highlands Ranch, Littleton, Colo.
Joshua Pakola, sde, 6-3, 267, St. Francis, Mountain View, Calif.
Nathaniel Peat, apb, 5-8, 175, Rock Bridge, Columbia, Mo. Diego Preciado, cb, 5-11, 175, The Classical Academy, Escondido, Calif.
Ryan Sanborn, p, 6-3, 195, Francis Parker School, San Diego, Calif.
Tristan Sinclair, olb, 6-2, 202, San Ramon Valley, Danville, Calif.
Nicolas Toomer, cb, 6-1, 176, Sandy Creek, Tyrone, Ga.
Salim Turner-Muhammad, cb, 6-0, 170, Episcopal, Alexandria, Va.
Josh Carlin, og, 6-4, 277, Sierra Canyon, Chatsworth, Calif.
Hayden Harris, ath, 6-5, 225, Eastside Catholic, Sammamish, Wash.
Carl Jones, ath, 6-1, 195, Bakersfield, Bakersfield, Calif.
Noah Keeter, wde, 6-5, 224, F. W. Buchholz, Gainesville, Fla.
Siale Liku, dt, 6-3, 323, Oakland, Oakland, Calif.
Shamar Martin, cb, 5-11, 170, Morse, San Diego, Calif.
Jahmon McClendon, rb, 6-2, 210, Monte Vista, Spring Valley, Calif.
Kain Medrano, ath, 6-4, 205, East, Pueblo, Colo.
William Nimmo, s, 6-1, 190, Mater Dei, Santa Ana, Calif.
Charles Njoku, wr, 6-4, 210, Wayne Hills, Wayne, N.J.
Sean Rhyan, ot, 6-4, 324, San Juan Hills, San Juan Capistrano, Calif. Beau Taylor, og, 6-5, 286, Bishop Gorman, Las Vegas, Nev.
John Ward, olb, 6-3, 227, Palmdale, Palmdale, Calif.
Donte Banton, wr, 6-0, 184, Deerfield Beach, Fort Lauderdale, Fla.
Micah Bernard, rb, 5-10, 187, Gahr, Cerritos, Calif.
Luke Felix-Fualalo, ot, 6-7, 300, Mater Dei, Santa Ana, Calif.
Falcon Kaumatule, ath, 6-8, 245, Bishop Gorman, Las Vegas, Nev.
Sataoa Laumea, og, 6-4, 305, Eisenhower Senior, Rialto, Calif.
JaTravis McCloud, db, 5-11, 186, Union, Tulsa, Okla.
Lacarea Pleasant-Johnson, cb, 6-0, 170, Mountain Pointe, Phoenix, Ariz.
Marist Talavou, og, 6-3, 316, St. John Bosco, Bellflower, Calif.
Jacob Bandes, dt, 6-2, 315, Pittsburg, Pittsburg, Calif.
Joshua Calvert, ilb, 6-1.25, 227, Oaks Christian, Westlake Village, Calif.
Cameron Davis, rb, 6-2, 187, Upland, Upland, Calif.
Taj Davis, wr, 6-1.25, 192, Upland, Upland, Calif.
Kamren Fabiculanan, cb, 6-1.75, 183, Westlake, Thousand Oaks, Calif. Troy Fautanu, og, 6-3, 289, Liberty, Henderson, Nev.
Nathaniel Kalepo, ot, 6-6, 341, Rainier Beach, Seattle, Wash.
Laiatu Latu, wde, 6-4, 272, Jesuit, Carmichael, Calif.
Trent McDuffie, cb, 5-11, 187, St. John Bosco, Bellflower, Calif.
Dylan Morris, qb, 6-0, 188, Graham-Kapowsin, Graham, Wash.
Noa Ngalu, dt, 6-0, 280, Menlo-Atherton, Menlo Park, Calif.
Bralen Trice, wde, 6-3.25, 220, Sandra Day O’connor, Glendale, Ariz.
Alphonzo Tuputala, ilb, 6-1.75, 249, Federal Way, Federal Way, Wash.
Asa Turner, ath, 6-3, 195, Carlsbad, Carlsbad, Calif.
Cameron Williams, s, 5-11, 183, Bakersfield, Bakersfield, Calif.
Armauni Archie, cb, 6-1, 175, El Cerrito, El Cerrito, Calif.
Jouvensly Bazile, apb, 5-10, 180, Golden Gate, Naples, Fla.
Travion Brown, olb, 6-3, 215, Linfield Christian School, Temecula, Calif.
Gunner Cruz, qb, 6-5, 227, Casteel, Queen Creek, Ariz.
Ma’ake Fifita, sde, 6-5, 250, Glacier Peak, Snohomish, Wash.
Tyler Garay-Harris, wde, 6-5, 230, Bishop O’Dowd, Oakland, Calif.
Konner Gomness, ot, 6-4, 270, San Joaquin Memorial, Fresno, Calif.
Rocky Katoanga, olb, 6-2, 205, El Camino, Oceanside, Calif.
Cosmas Kwete, olb, 6-3, 220, Central, Phoenix, Ariz.
Billy Pospisil, wr, 5-11, 190, Pomona, Arvada, Colo.
Simon Samarzich, ls, 6-0, 200, Upland, Upland, Calif.
Patrick Utschinski, ot, 6-7, 280, Walla Walla, Walla Walla, Wash.